When I visited the Landmark Trust's Astley Castle last year, it left a powerful and lasting impression on me, so I was pleased when Witherord Watson Mann's restoration project was, to widespread popular approval, announced as the winner of this year's Stirling Prize. The combination of the emotional power of the ruins and the history associated with the building, and its contemporary transformation into an intelligent piece of modern architecture, offers a thought-provoking experience for those lucky enough to visit and/or stay in it. "Staying in a beautiful and important historical building can be an inspiring, uplifting and transformative experience" says Anna Keay, Director of the Landmark Trust, who have today launched a new scheme called 50 for Free. Thanks to a generous philanthropic donation the Trust will be giving away completely free breaks in outstanding buildings to the nominees of charities and other not for profit or educational organisations. 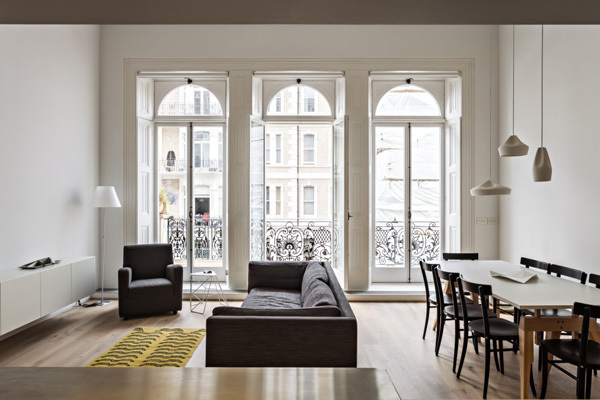 When VW & BS were invited to redesign this central London flat the brief was to create a flexible living space that could accommodate a variety of functions and be simple in design. Their starting point was to restore the first floor room, which had previously been divided into a separate kitchen and living room, back to something of its originally intended proportions. This meant that the three tall arched french windows at the front of the property could be fully appreciated and the lovely terrace overlooking the street with its wrought iron railings be brought back into use. I'm sure I'm not alone in dreaming of owning a summer house. This house on the west coast of Sweden by architect Mikael Bergquist, has a purity of design that is both modern and traditional at the same time. 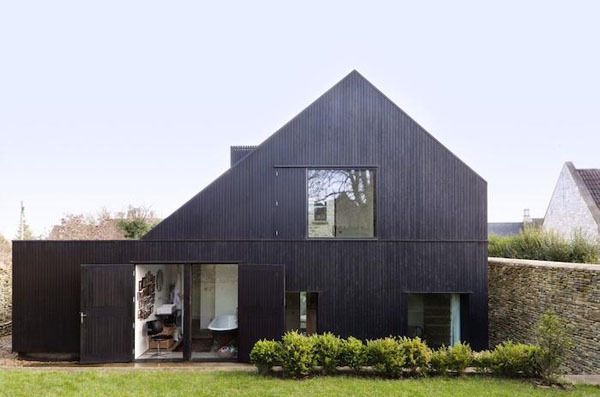 Clad with untreated timber that will fade to grey over time it is surrounded by woodland and was designed as a summer retreat for a family living in England. Can you live without space and light? Do you ever think about how the amount of space and light in our homes and workplaces affects our quality of life? RIBA have just launched a campaign called HomeWise, aimed at improving the space and light standards in new build homes in the UK. British homes are shrinking. The average UK home size used to be 86 square metres but is now a measly 76 square metres. Our new build homes are the smallest in Western Europe - homes in the Netherlands are 53% bigger and homes in Denmark are a whopping 80% bigger! This beautiful and striking home, previously featured in World of Interiors, and belonging to Niki Turner, a theatre and opera designer who also specialises in property design, is currently for sale through Knight Frank. This month's property picks include a grade 1 listed crescent house in Bath, an east London warehouse conversion that retains the character and integrity of its industrial past and a highly individual water tower conversion in Faversham.